They say the apple doesn't fall far from the tree, an adage proven Thursday on Independence Day at the International Bible Contest. Contest winner Eyal Yitzhak Matas was the pupil of a very unique instructor - his Bible studies teacher was none other than former MK Dr. Michael Ben-Ari. Matas is a 15-year-old from Rehovot who studies at the Darchei Noam Yeshiva, a private religious academy in Petah Tikva. His teacher in Bible studies is the well-known nationalist leader Ben-Ari, who holds a doctorate in Land of Israel Studies and Archaeology, and is a published historian researching Jewish history and specializing in the late Second Temple period and the revolts against the Roman occupation. Ben-Ari sent his congratulations to his student Matas, writing in an SMS text message, "dear Eyal, of you is said happy is the one who grows in Torah, and whose toil is in Torah." "I watched the whole contest, and was very happy for you. Hashem (G-d - ed.) will bless you with fulfilling the words of this Torah. To grow and shine in your Torah. Much love, Michael Ben-Ari," wrote the proud teacher. The young contest winner responded with a modest answer, writing "thanks rabbi." Ben-Ari showed humility as well, emphasizing that he is not the only teacher behind Matas's impressive achievement. 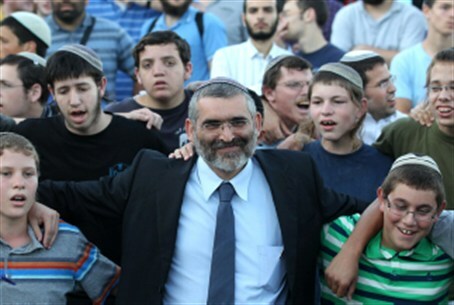 "I'm not alone in the matter, I'm one of a crew of teachers at a wonderful yeshiva that does holy work headed by the dean Rabbi Moshe Man, and Bible (studies) coordinator who encourages and leads, Rabbi David Tai, and his (Matas's) rabbi and educator Rabbi Eliyahu Vizel," noted the former MK. Ben-Ari concluded by saying, "beyond anything else, this is an achievement of Eyal's that is listed on his name, this is a moving achievement of a wise student who has a magnificent future ahead of him."